As I was looking through the past issues of The Historian newsletter, I came across a photo that I found fascinating. Sometimes a photo can truly show us how much the world has changed. 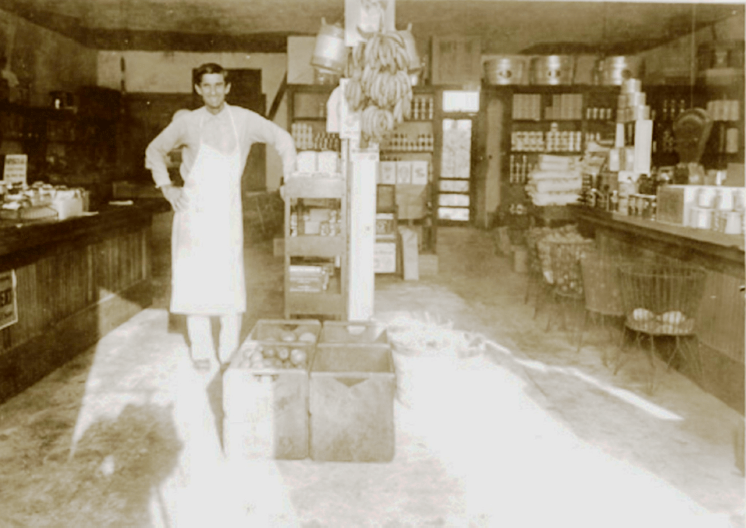 The photo depicts Terrance Ward in his small grocery store. If you look carefully, there is much detail in the picture, and a few mysteries! What is hanging on the post in the middle of the picture – bananas? On the back shelf we see some good old-fashioned galvanized wash tubs and several neat rows of canned goods. On the counter to the right we see a scale and more stacked cans, and several open bins with produce. Near Mr. Ward’s feet we see some open crates with what look like apples. What other details do you see? Terry Ward in his grocery store. Tagged Boynton Beach, grocery, Terrance Ward. Bookmark the permalink. The shadow of the camera with its flash bar and tripod leg. You might be able to id the camera from that. Yes! The camera’s shadow – looks to be quite large.